New gloves! Just in time for the cold snap! There’s something about a pair of woolly gloves that reminds me of being a child. Lucky enough to have an anxious mother (flip side reserved for another post!) I braved the cold winter looking like the sporn of Jo Brand and the Michelin Man. I remember shifting around like a gated racehourse as the wool and the thermals and the scarves and the hat were draped around me. Tugged at, squashed down and spun around; my body temperature would reflect a spring holiday on Kefalonia by the time I opened the front door! 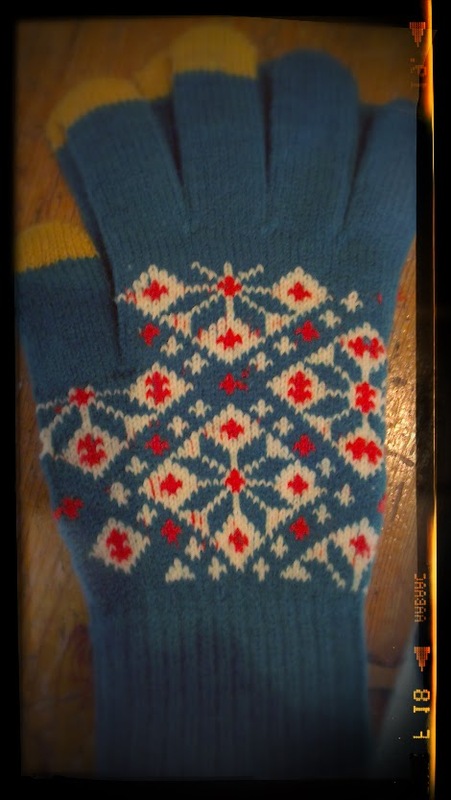 Suffice to say, my new gloves remind me of those I’d wear as a kid in the 70s / early 80s. Slightly retro colours, slightly itchy, and not lined, so that when you try to pull them on, your fingers get tangled on the skeins inside, and your thumb seems to head in the wrong direction, or your little finger gets confused and forgets it has a cover all to itself. Not to be donned in a hurry, my irritation is tempered by an odd feeling of nostalgia. Now, if that ‘s not a sign of the times, I don’t know what is!